The official season of colour - Holi is here. It’s such a pleasurable festival. It brings out the pure oozing love and drains away all the sorrows for the day. It is nothing but just splashes of colour all over and joy. You can hear families laughing and crowds giggling and enjoying the entire festival of colours. Holi is a literal translation of adding colours of joy in one life. And because we all been heavily influenced by Deepika from the Holi anthem ‘Balam Pichkari’, we want to dress our best on Holi. 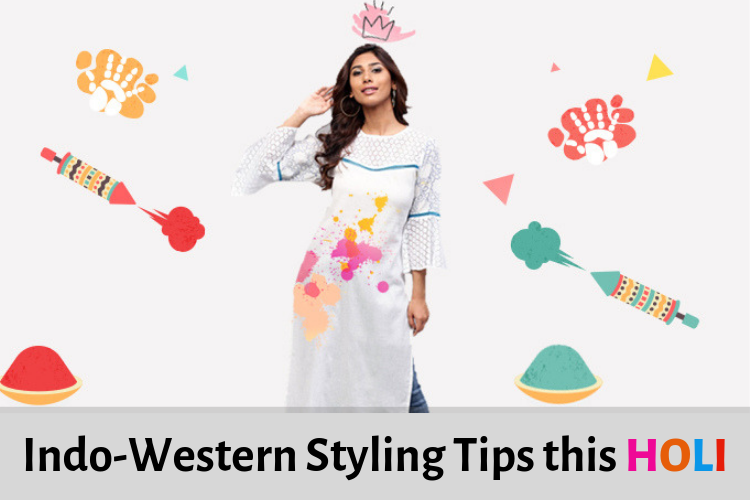 Here are a few tips to dress up and look your finest, even though the clothes are soon going to be dyed with various hues of gulaal, kaala, neela, hara, to name a few. White is the official colour of Holi. It was majorly promoted in the Bollywood movies and now has been a raging trend. To wear white on Holi is the primary agenda of playing the festival for some. Some feel the outfit looks incomplete. White is a plain hue which pops the colours thrown while playing, making it a major essential in Holi clothing. It portrays every colour splashed in such a beautiful manner as if you upbeat a rainbow. Yes. This category exits too and you could be one of them! But fear not. The human civilisation won't oust you (yet). There is an array of colours you can opt for, if not interested in white, such as canary yellow, blush pink, turquoise blue, lemon yellow, coral, to name a few. These are a few colours that might rock your outfit at the Holi party. Kurtas are the very perfect outfits to choose for Holi parties. It is a perfect traditional option to choose too! Opt for a full sleeve kurta so that it helps you cover maximum skin helping you in avoiding the colour splash on your skin. You can also opt for darker jeans as the colour can be washed off for later use and also it gives you the required colour pop! The best part of indo-western clothing is the comfort of wearing and combining comfortable clothes from both genres. Like a crop top and skirt. Yes, that's right - it is like a match made in heaven. So pull out a not so used crop top and put the skirt you wanted to get rid of to buy a new one. It makes a great outfit for Holi. A final tip to remember is to enjoy responsibly and safely.